Bloggers, would you like to win £200 to spend on brand new tableware at M&S? Runners Up Prizes go to – Tidy Away Today and Sew Yeah. Thank you to everyone who took the time and trouble to enter! If your answer is yes and you have a flair for interiors and design, then why not enter this Magical Dining Room Competition! 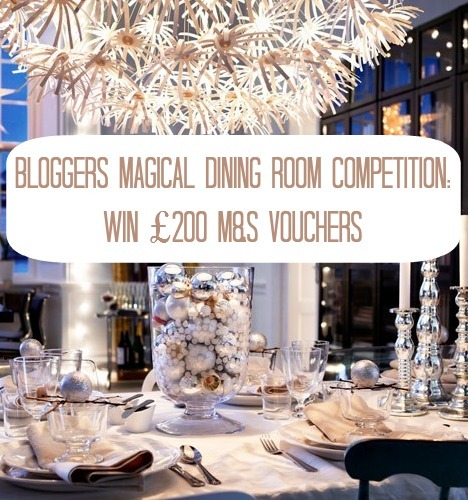 To be in with a chance of winning all you have to do is create a blog post that shows what your dream dining room would look like, and how you would add a little magical and sparkle for a special occasion. If you are posting before Christmas then you may like to include some of M&S’ festive tableware in your post. If you are posting in the New Year then let us know what items you would pick for a special dinner party. To get you in the mood and give you some ideas here’s what I spent £200 on for my Magical Christmas Dining table with the help of some gorgeous M&S items. Create a mood board to show us what your dream dining room would look like and post on your blog. (You can use a tool like Polyvore to create a mood board). Check out my Polyvore Tutorial if you need any help, or you could just copy the images and upload them onto a collage in Picmonkey. M&S has asked me and Jenny of The Treasure Hunter UK to judge the entries and Jenny is also running the competition over on her blog, so you can choose whether you enter here or there. Jenny and I will choose one overall winner from all of the entries and two runners up! The main winner will be awarded a £200 gift voucher and the two runners up will each win £50 to spend at M&S. We will announce the winners on our blog two weeks after the competition closes. Full Terms and Conditions can be found on the M&S Stories Website. Disclosure: M&S gave me £200 of dining accessories for the launch of this competition. The table is set, ready for a Christmas Feast. Here is the the link to ‘My M&S Magical Dining Room’ from my blog on 23rd Dec. I have had a lot of fun putting my board together and shall be looking out for ‘Eric’ when I’m next in Marks shopping! Thanks Clare – good luck! Thanks Becky, and good luck! What a great competition, I loved creating my board, even if it did stop me from doing more important things! Thanks for joining in Helen, good luck!! Lovely, thanks for entering Claire, and good luck! Wow, I loved doing this competition and it took me back to a very happy moment 🙂 My entry is a romantic magical dining room for Valentine’s night. Thanks for entering Antonia, good luck! !